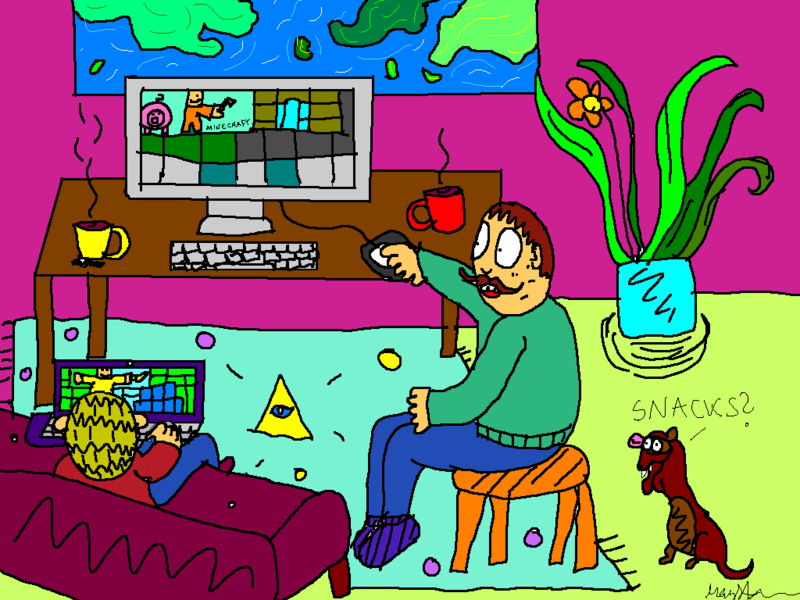 Cartoonofmylife: Minecraft gaming night alá Gunnar & Lucas | Amsterdam, baby! And welcome to todays cartoon blogpost with updates from my life. Lucas and I have a friend from Norway over. His name is Gunnar. And Lucas and Gunnar have dived into the world of Minecraft, so I decided to avoid boredom and make a cartoon about it. So here is today´s Cartoonofmylife update. Hope you enjoy! And stay tuned for more colorful crazyness. This entry was posted in amsterdam, Art, cartoon, cartoonofmylife, colorful, happy, humor, illustration, LOL, norwegian design and tagged Amsterdam, art, artsyfartsy, Cartoon, cartoonofmylife, colorful, happy, humor, LOL, new cartoon, todays cartoon, visitor from norway by maypaj. Bookmark the permalink.